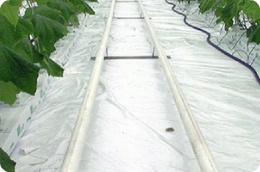 During the cultivation season the paint layer of the heating pipes damages due to temperature fluctuations, high humidity, wear and tear by pipe rail trolleys and rust formation. This has a negative impact on the heat-release and the light output. Therefore, it is recommended to paint the heating pipes during the crop rotation every year. In this article our specialist provides you with tips for painting the heating pipes in the greenhouse. White heating pipes reflect up-to 50% more light and provide up to 20% more heat-output. Therefore, there is less need for heating, which in terms leads to lower heating costs. Painting the heating pipes in the greenhouse is therefore, an simple and cheap way to save energy. Do you have a new-build greenhouse? Make sure that you keep the tubes as clean and dry as possible before painting. For this you can cover-up the tubes with plastic. This prevents rust formation and sanding, therefore, the paint adheres better to the metal. Provide a dry, clean, dust and grease free surface with an existing greenhouse. Remove rust, paint flakes, and leaf(green) and ensure that the tubes are degreased. This ensures that the paint can adhere best to the tubes. When painting the heating pipes make sure that you use a suitable product. Make sure that the paint has high coverage, is resistant to moisture and high temperatures, and that the product is safe for your crop. An example of a suitable paint is Hermopal. Apply the paint to a lukewarm pipe. Any possible moisture in the paint is then immediately expelled. If the pipe is a few degrees warmer than the environment, it is easier to process and it flows even better. The easiest way to apply the paint is with a tube roller or paint gloves. Ventilate both during application and after application of paint. The vapors of the paint can make you feel unwell. When you have questions regarding painting of heating pipes, or you would like advise? Please contact the product specialist Crop Rotation, Martin Meuldijk, or ask your questions in the form below. If you ask a question by using the form below, we'll respond within 24 hours on working days.